I started programming in 7th grade. In the late fall of 1982, a computer club was founded in my school. When we came back to school after Christmas break, in January 1983, some older students taught some classes in BASIC in the evenings. Attending those classes were a requisite for getting the magnetic card that gave us access to the computer room (as long as there were no regular classes taking place there). In preparation of the classes starting, I went to the library and picked up a book on programming the ABC 80 computers we had in school. I started learning programming by writing code by hand in a notebook, to understand the concept. I spent the Christmas break learning BASIC, so when the classes started in January, I had a pretty good understanding of the concept of programming. A couple of years later we got another type of computer in school, and I switched to Pascal as the programming language of choice. I spent on average 3 or 4 hours in the computer room each day (during lunch breaks and after school) for the next 5 1/2 years… I even managed to convince the school to let me borrow one of the computers and take it home during one Christmas break, as I was working on a big project. Hersby skola on Lidingö, where I spent the years 1982-1988 learning programming. My schedule in the last year of High School (1987-88). 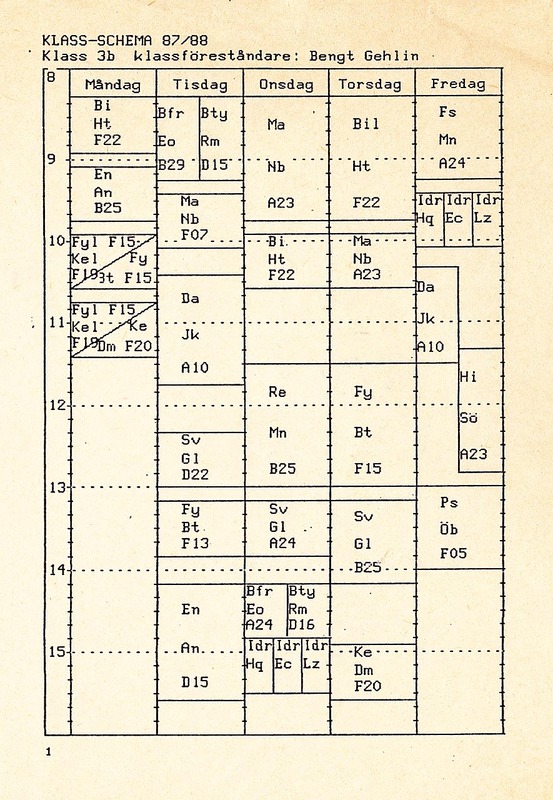 Computer Science is coded “Da”, and we had it Tuesday and Friday. 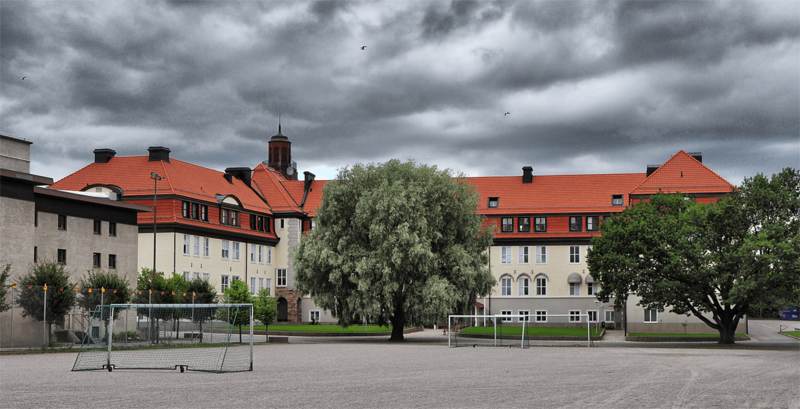 After finishing what’s in Sweden is called gymnasium (equivalent of High School in the US), I was not motivated to spend additional 4 years or more going to university. However, I found a one-year specialty course in Systems Programming and Computer Science, where they crammed 2+ years into one year, with 8-hour days five days/week. I applied and was accepted. However,after a couple of weeks, the assistant principal (who was also one of our main teachers) came in and told us that the class had to be cancelled. The class was simply too small, and they had not been able to get any more students to apply. The class was postponed and would start over in January 1989. In the mean time we were encouraged to find an internship or entry-level job in the IT industry. I picked up the yellow pages section of the phone book and looked up computer companies. Being a person thinking outside the box, I started going through the companies in reverse order. I figured that anyone else in the class would start from the beginning. I started cold-calling some companies, and after a few calls, I got a hit. This company called Microsoft was interested, they needed someone in tech support, to answer calls from customers and solve their problems. I called Arne back the following week to verify that he got the letter, and he asked me to come in for an interview the next day, Friday September 16. I took the subway to the Microsoft office and met with Arne, who performed a short interview and a little test of my problem solving skills. He had me perform some actions in Word for DOS, a for me then totally unknown program, to see how quickly I could solve some problems. A few minutes later I walked out the door with a job waiting for me the following Monday and the user’s manual to Windows 2.03 under my arm with orders to read it over the weekend… So on September 19, 1988 I started working at Microsoft, my first real job in the computer industry, or IT business as it is called these days. I have to say that I did learn an enormous amount of things at Microsoft. There was no formal training, you were expected to learn things on your own. But my coworkers went out of their way to teach me things. Thanks Anna, Micael, Magnus, Rolf and everyone else that helped me and taught me about the Microsoft products. After working at Microsoft during the fall I went back to school and finished the education, while working at Microsoft during school holidays and the summer, as well as for a few months after graduation. I then served in the Swedish Air Force for 11 months, as the country still had mandatory military service at this time. I actually intended to go back to Microsoft after the Air Force, but I was offered a job as a programmer right before I left the service, and I started my career as a programmer/developer in early 1991. It was now I started playing with Visual Basic 1.0, released in the summer of 1991. I learned programming using traditional BASIC back in 1982-83, before switching to Pascal some time around 1985, and then to C in 1989. I quickly realized that Visual Basic was a great product. It removed much of the complexity of creating Windows programs, and the developer could focus on the actual functionality and business logic instead of having to write pages of code to handle windows and events. After the company I worked for went bankrupt in the end of 1992, I got a job at IDG Sweden as a journalist at the weekly publication Computer Sweden. It was during my time there I learned about (among other things) HTML and Lotus Notes, knowledge I still use to this day. I worked at Computer Sweden for five years, covering the PC marketplace (both hardware and software), before moving to Boston and taking a position as Notes developer with IDG in the US. After a little over four years in Boston, my then-wife wanted to move closer to her family in Texas, so we moved to Arlington, TX and I got a job with Deep South, a Dallas-based insurance company where I still work 11 years later, as a Notes/Domino developer. I am also taking on some administration tasks, after out previous network admin and operations manager left the company last year. I count myself very lucky to have a job I love. How many people can say that they been working 25 years with something they like? I also had the luck to work almost exclusively at good companies, and having good managers/bosses. I have for example been able to go to Lotusphere every year since 1997 (as well as a technical conference in 1996 that were a pre-cursor to Lotusphere Europe). Finally I once more want to thank everyone who over the years helped or supported me, and who made it possible for me to be where I am today. 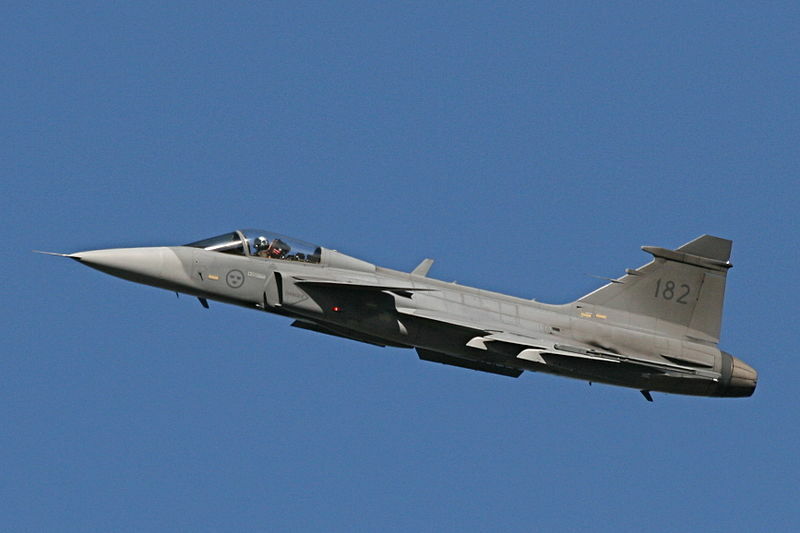 Swedish Air Force JAS39 Gripen (single seat variant). Photo by Ernst Vikne (Creative Commons BY-SA). 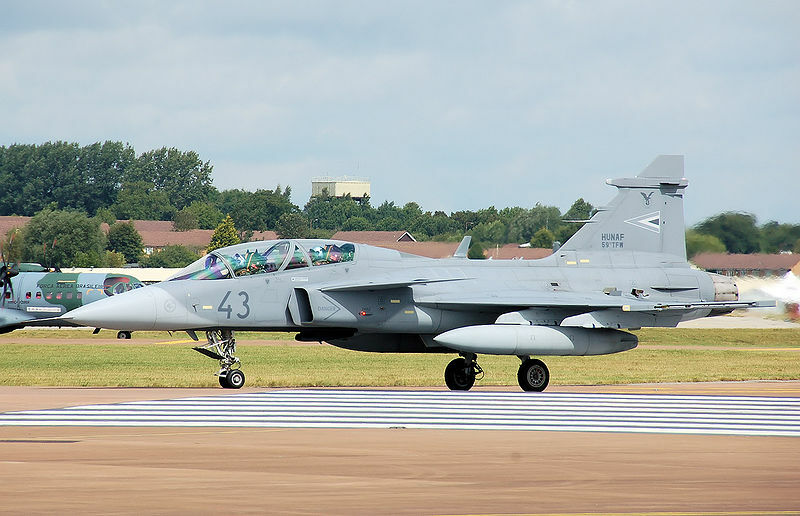 According to an article in Aviation Week, Boeing is planning to team up with Swedish airplane manufacturer Saab to offer a new two-seater training version of the JAS 39 Gripen fighter to the US Air Force. The old Northrop T-38 is being retired, and a new trainer is needed in the future. Approximate 350 trainers are needed, but in addition the fighter could be useful for aggressor training (e.g Red Flag and Top Gun), currently flying mostly F-15 and F-16 fighters. Another use for the two-seater JAS 39F model would be as a companion trainer for the F-22 Raptor and F-35 Joint Strike Fighter, neither of which are being produced in a two-seat version. Currently T-38 is used in this position as well. A source in the USAF quoted in the Aviation Week article hints that the step is not very far to use an affordable air defense fighter to replace the aging Air National Guard F-15/F-16 fighters. JAS 39 have been produced in four different variants. JAS 39A and B were the initial version that entered service in 1996. Some of them have been updated to the new C/D models, and additional JAS 39C/D have been delivered to countries like Hungary, South Africa, Thailand and Czech Republic. Switzerland is intending to buy the new JAS 39E single-seat model, after a referendum in 2014. Sweden is also planing to upgrade to that model when it becomes available. The F model Boeing is intending to offer the US Air Force is a brand new development, possibly with some functionality not needed in a trainer removed to save cost. In many of my Notes programs, I need to perform lookups into the Domino Directory (the database formerly known as Name and Address Book or NAB). So my solution was to create a class that handle those lookups for me, and exposes the most common lookups as separate methods. We have a slightly modified version of names.nsf, with a few added fields. One of them is what we call ParallelID, which is the user’s ID in a system called (surprise!) Parallel. Since I perform that lookup all the time, I created a separate method for that one called GetParallelID(). Same with manager lookup for a user, I created GetManagerName() for that. The methods you probably will use the most are GetText() and GetValue(). Since I think this class could come in handy for others, here it is. Enjoy! Msgbox "No document found for '" & personname & "' in " & nabname & " on " & server & ". ",,"NotesAddressBook::GetNABdoc()"
tmpValue = doc.GetItemValue("FirstName")(0) & " "
tmpValue = tmpValue & doc.GetItemValue("MiddleInitial")(0) & " "
'*** in a local database, otherwise current server is used. Msgbox "Failed to open " & nabname & " on " & server & ". ",,"GlobalConfig::New()"
Last week, Volker wrote this excellent article about Tomas Duff (a.k.a. Duffbert). Then yesterday the news reached me about the sudden death of Rob Wunderlich, a long-time member of the Lotus community. I had already started on a post — in preparation of my upcoming 25 year anniversary of becoming an IT professional — where I was going to acknowledge a number of people who meant much to me and who were important in making me to what I am today. I have decided to post this text a bit earlier than originally planned. Tonny Olsson – my cousin who worked at Hewlett-Packard and let me see my first computer (complete with a plotter and an acoustic modem he used to connect to HP from our house) in or around 1975. He also introduced me to the world of HP calculators and RPN. Peter Nilsson – my childhood friend and classmate, who introduced me to Basic programming when he got a VIC-20. We spent an evening (right after he got it) entering a program from the handbook, but we did not get it to work that day. Later on we got some programs working. I also want to thank several of the older students in the school’s computer club, who helped us younger students when we had questions. I want to mention Hjalmar Brismar, Petter Aaro and Matthias Bolliger, who were always there with advise and knowledge. Arne Josefsberg – head of tech support at Microsoft, he took a chance and gave me a job without me having touched any Microsoft program previously. Rolf Åberg, Magnus Andersson, Anna Söderblom and Micael Dahlquist – also at Microsoft. They helped me learn all kind of new things, from Windows programming using C and the Windows SDK to regular C programming using QuickC, from Excel to Word for DOS. I also ended up wothing with Micael at another job a few years later. Per Engback and Ingvar Gratte – my two main teachers at the systems programming class. Despite this being just a one-year class, I learned plenty, especially C programming and Unix. Krister Hanson-Renaud and Harald Fragner – two programmers/hackers who inspired me over the years, and who also introduced me to the world of Bulletin Board Systems (BBS). I had been exploring some earlier bulletin board systems back in 1987-88, but it was in 1989-90 I became “social” on these networks. Both Harald and Krister wrote their own BBS systems, and I ended up running one of them myself for a short time, but it was more of a test. All my friends on CT and SKOM, the two BBS:s I frequented the most, between 1990 and some time in 2004. Here I learned about online debates, flame wars and of course plenty about hardware, software and programming techniques. Eva Sparr – the managing editor at Computer Sweden, and who I reported to directly. She usually gave me very free reign to explore new stories and test software/hardware as I saw fit, something that helped me develop my analytical skills. Erik Geijer, Anders Lotsson, Maria Lindström and Kenneth Bäcklund – four of my colleagues at the magazine, experienced journalists who gave me a crash-course in writing, journalism and penmanship. A big thank you for all the time you spent giving me advise and proof-reading my articles. Erik also introduced me to HTML in 1994. Enrico Barile – he exposed me to Lotus Notes, and started me on the path to where I am now. We spent many evenings at his office, building websites using InterNotes Web Publishing, which eventually merged with the Notes server in version 4.5 and became what we today know as the Domino server. I mainly worked on the HTML part, but I did learn a lot about Notes/Domino. And of course all my friends in the Lotus/ICS community. Over the years I have gained enormous amount of knowledge from your sessions at Lotusphere, blog entries and direct discussions (in person at conferences or through Sametime/email), or though services to the community. In addition to Tom Duff, who I already mentioned, I would like to list just a few: Rocky Oliver, Andrew Pollack, Brian Benz, Scott Good, Julian Robichaux, Francie Tanner, Rob Novak, Chris Blatnick, Declan Lynch, Chris Miller (the one-slide-man! ), Paul Mooney, Bill Buchan, Mark Myers, Matt White, Bruce Elgort, Yancy Lent (thanks for PlanetLotus! ), Jake Howlett (who I never met, but who’s site codestore.net have been a great resource over the years), Joe Litton, Stephan Wissel, Tim Tripcony, Nathan Freeman, and so many more. Not to forget all the Lotus/IBM people I met at Lotusphere, like Maureen Leland, Dan O’Conner, Mary Beth Raven, Susan Bulloch and all the others I been harassing over the years in the Ask the Developers lab at Lotusphere. I also want to thank everyone who presented at Lotusphere and shared their knowledge over the years. Finally I would like to mention my parents, Marie-Luise and Stig Martinsson. Today (September 2) would have been my dad’s 87th birthday. They were great parents, and gave me the freedom I needed to read books all summer long (even if my mom sometimes thought I should go outside for a bit) and to take apart old radios or mechanical calculators, or solder together some electronic contraption in the basement of our house. Later, when I spent all my free time after school in the computer room, they were concerned that I was negligent with my home work, but they never forced me to abandon programming. And when I look back, I realize that all those thousands of hours spent in the computer room is what made me to what I am today. Part of the Lotus community/bloggers meeting for BALD at Lotusphere 2011. The traditional end-of-Lotusphere picture with part of the community, this one from Lotusphere 2010. Blogger community at Lotusphere/Connect 2013. Photo by John Roling (CC-BY-NC-ND).